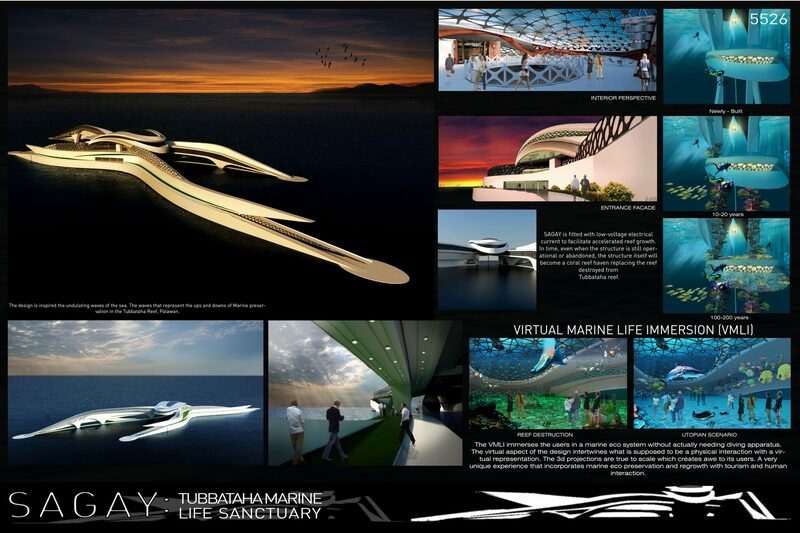 Sagay: Tubbataha Marine Life Sanctuary | gURROO - A new generation of innovative minds. This somewhat rare occurrence, however, doesn’t save from destruction caused by various causes. While the reef is monitored by reef rangers 24/7, the damaged reefs caused through the years cannot be brought back unless we take action. This is the sole purpose of the Marine Sanctuary (NAME OF STRUCTURE) – to protect and recreate lost coral reefs. This tourism infrastructure will house restaurants, tourist centers, marine ranger reef monitoring offices, and a Virtual Marine Life Immersion (VMLI) Facility. This facility will immerse the users on what marine life looks and feels like as if you were underwater. This facility employs virtual information through visual representation of true to scale marine life projections. There are three levels of VMLI Facilities. The first level depicts the destruction of the coral reefs through man-related activities. The second level depicts the destruction of the reefs through natural causes or global warming. The bottom most level depicts a utopia of coral reefs where man and corals co-exist and benefit mutually. Coral reef growth ranges from 5 mm/year to 100 mm/year. 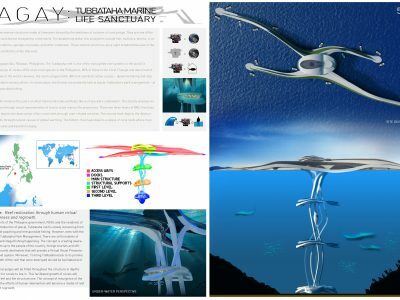 The structure is made with steel structural members that are fitted with low-voltage electrical current to facilitate accelerated reef growth. In time, even when the structure is still operational or abandoned, the structure itself will become a coral reef haven replacing the reef destroyed from Tubbataha reef. This new coral reef will become the largest man-made coral reef that will house millions of marine flora and fauna. 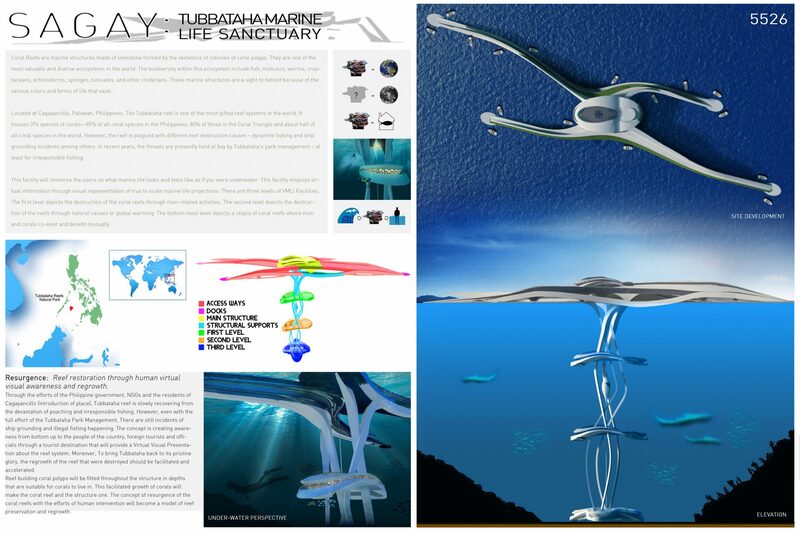 The vision of creating a safe house for marine life while maintain human activities and progress will be fulfilled by this development. Resurgence: Reef restoration through human virtual visual awareness and regrowth. Through the efforts of the Philippine government, NGOs and the residents of Cagayancillo (introduction of place), Tubbataha reef is slowly recovering from the devastation of poaching and irresponsible fishing. However, even with the full effort of the Tubbataha Park Management, There are still incidents of ship grounding and illegal fishing happening. The concept is creating awareness from bottom up to the people of the country, foreign tourists and officials through a tourist destination that will provide a Virtual Visual Presentation about the reef system. Moreover, To bring Tubbataha back to its pristine glory, the regrowth of the reef that were destroyed should be facilitated and accelerated. Reef building coral polyps will be fitted throughout the structure in depths that are suitable for corals to live in. This facilitated growth of corals will make the coral reef and the structure one. The concept of resurgence of the coral reefs with the efforts of human intervention will become a model of reef preservation and regrowth.